@WENeighbours @EalingFlaneur I'm always open! Did Oaklands school car boot on Saturday – it was a great success, lovely people – made #155!!! !Roll on the next one, May 17 – never thought I’d enjoy it so much. Also thanks to our stall neighbours who gave me their lovely old brass lamp (yes, I know I shouldn’t be acquiring) and all we gave them was an old packet of dishwasher powder!! Lots of kids had a nice time in the playground, too, and there were hot dogs and burgers and tea and coffee. Good stuff. @oaklandsealing not only held a lovely car boot sale, but were good @WENeighbours by using string to attach the posters to trees. Thank you! Hanwell gets ready to rock as Hootie music festival pays tribute to ‘Father of Loud’, Jim Marshall. I went to the first Hanwell Hootie last year and it was brilliant so if you enjoy live music from some great local bands then get ready for this year’s Hootie on Saturday 5th April from 4pm. The 2014 Hootie features live music from 30 bands playing across six venues between 4pm – 11pm, including The Prince of Wales, The Inn on the Green, The Fox, The Duke of York, The Kings Arms and The Village Inn. There’ll also be ‘fringe’ music activities in around Hanwell, including The Clock Tower Café, Ryan’s Bar and W7 Emporium. Confirmed acts include: the nine-piece swamp pop, New Orleans blues group, The Dirty Gentlemen; the raucous rock ‘n’ roll gypsy band, Tankus the Henge; and nothing short of a super group, Bad for Lazarus, who boast ex-members of Nine Inch Nails, The Eighties Matchbox B-Line Disaster and UNKLE. 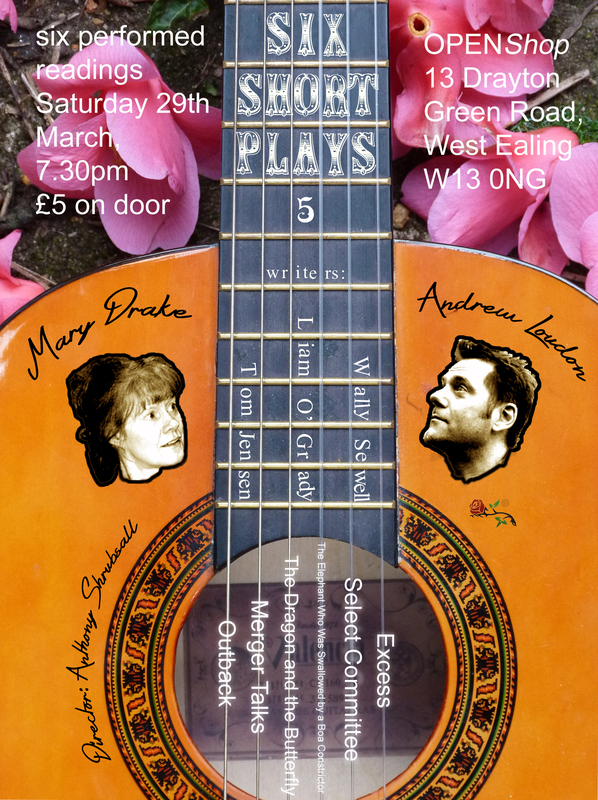 The return of Short Plays is back this week on SATURDAY 29TH March, 7:30pm at Drayton Green Road W13 0NG . A format that is quickly becoming a tradition, Short Plays brings to Ealing a dynamic round of fresh and witty theatre in manageable doses. Written by: Tom Jensen, Liam O’Grady and Wally Sewell, performed by Mary Drake and Andrew Loudon and directed by Anthony. Parking problems are almost guaranteed to arouse passions amongst residents. Now those of us living south of the Uxbridge Road and west of Northfield Ave have our chance to get steamed up. The Council has received a number of requests for a CPZ in the Fielding Primary School area. Following these requests and a parking survey, the Council has issued a consultation about a CPZ. The consultation covers a wider area to take in to account the perennial problem of parking displacement whereby areas surrounding a new CPZ get more cars parking on their streets. I always feel a bit ambivalent about CPZs. Living very close to the West Ealing shopping centre in an as yet non-CPZ zone I can understand the frustration of not being able to park anywhere near your house. Yet, and it is a big yet, I worry about the impact on local businesses and their staff who may have to drive to work as public transport doesn’t work for them. A light touch CPZ, say with one hour in the morning and one in the afternoon, should not have that big an effect on shoppers who can usually adjust their shopping times. But it’s far more difficult for people who come to work in West Ealing as they will usually have set working hours. How do they deal with the impact of a CPZ? The consultation ends on 18th April. In the meantime, there is an exhibition about the consultation plans on Sunday 30th March 11am – 4pm at Northfield Community Centre in Northcroft Road. We at Christ the Saviour C of E Primary School had our sponsored bunny hop this week! All the infants wore their bunny ears and hopped away, then the PTA provided the children with a well earned biscuit and drink! It was lovely seeing the older year 5 children from the juniors site helping the really little ones. Think I should also mention Neo hairdressers again, they always manage to find me last minute appointments and free fringe trims for regular customers. They’re also offering a discount, 25% for new customers if you mention this facebook group. I love Beauty by Jas. The shop is near the british heart foundation and downstairs it is clothes which jas’ s husband looks after and then upstairs is where you can get threading, waxing, massages by Jas and her girls. They are lovely, I recommend. For me it has to be Bunty’s wool shop buried in the back of Daniels. It has been there over 40yrs and stocks a great range of yarn including Sublime and Debbie Bliss alongside workhorses like Patons, Wendy etc. A lovely selection of buttons and also general haberdashery such as bias binding etc. Mr Hafiz, the owner is knowledgable, friendly and ever so slightly encouraging… I have a hard time leaving with just the stuff I went in for. Definitely the fruit and veg shop on st John’s parade – such friendly service from a lovely family. 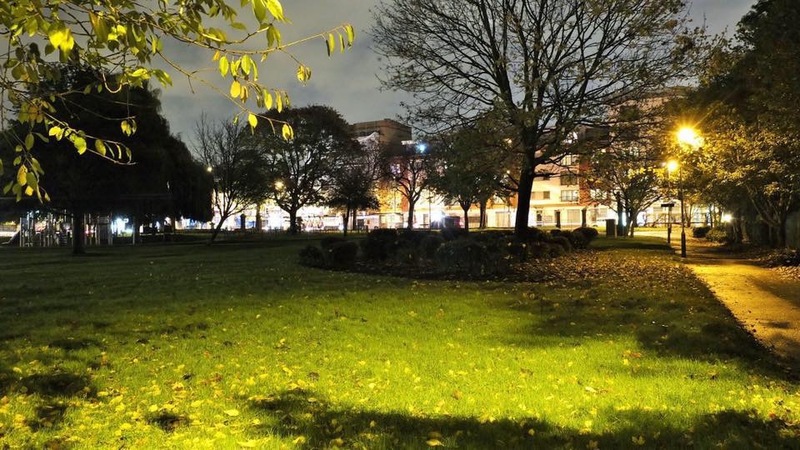 Although also a vote for buntys and an honourable mention for the forester pub which has just gone from strength to strength in the last year or so. Just put my availability down for Ealing Foodbank. It looks like the warehouse in Hanwell is potentially going to be opening longer hours so for those of you who can only help after work this would be an ideal opportunity to get involved. Food and Fuel, the new owners of The Grosvenor pub, met up with locals in one of their ‘Maggie’s’ outlets on New Broadway W5 last night (Tuesday 18th March). The Grosvenor name will be retained as will the stained glass and beautiful, original wooden bar and panelling. Five real ales are promised as well as English/Mediterranean/Gastro Pub food. No talk of juke boxes, pool tables or Sky Sports! Opening at 11am seven days a week with proper coffee and family friendliness this all sounds like a winner. The refurb/rebuild has proved somewhat costly and upstairs apart from a live-in manager’s flat the function room has not yet been restored. Hopefully it will be later in the year. Today is the start of Week 5 of our 150 days of community project. Don’t know what we’re talking about? Then click here. @WENeighbours Enjoyed tea and cake and wonderful retro atmosphere at Tea Darling in West Ealing's Pop Up Shop. 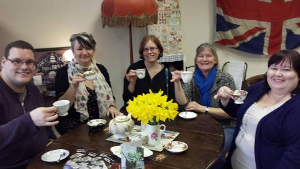 Eight or so neighbours (almost) spontaneously turned up at the pop-up vintage tea-room on Sat March 8th and drank tea, ate cake and chatted. It’s strange that it’s extraordinary but above all, it’s just brilliant. Thank you ’150 events’ for making such simple things possible.